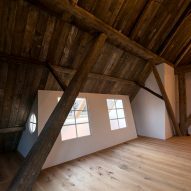 Dutch designer Piet Hein Eek and architect Iggie Dekkers have transformed a century-old barn in the Friesian village of Woudsend into a guesthouse designed to showcase an aged timber roof. 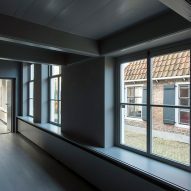 Eek and Dekkers, who run the studio Eek en Dekkers, began the renovation of the Omke Jan barn in 2014 – 110 years after its initial completion in 1904. 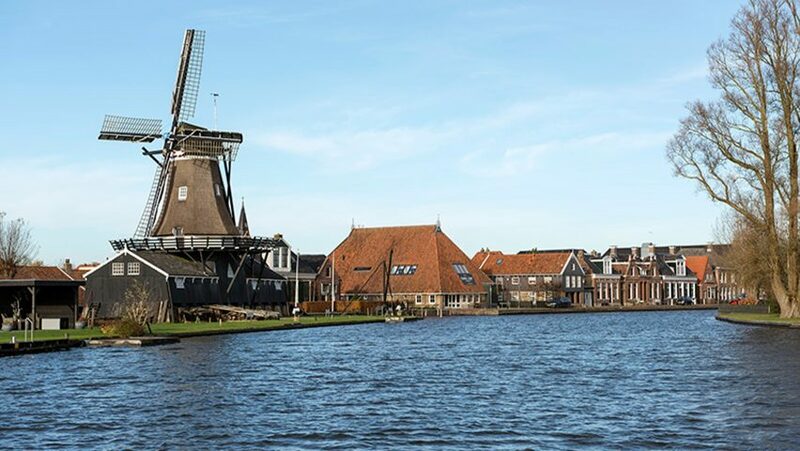 The client wanted to transform the building, which is located beside one of the village's two windmills, into a bed and breakfast where guests could enjoy the locality's produce. 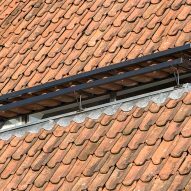 Guests are served milk and meat from the region's famous Friesian cows, as well as local flour and wood, and are encouraged to catch and smoke their own eels in the village smokehouse. Ample cooking and dining spaces are spread across the ground floor of the reconfigured property to cater to this emphasis on enjoying local foods. 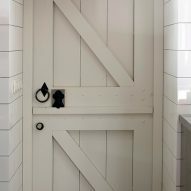 "In keeping with this wish for authenticity we wanted to emphasise the original qualities of the farm as much as possible. Showing off the majestic roof construction in its full glory formed the starting point for the design," said the studio. "We were faced with the choice of searching for contrast between old and new (modern) or to match the existing building." 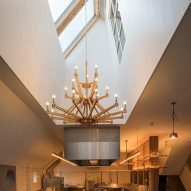 The studio cut a large atrium through an "ugly" mezzanine floor added in an earlier renovation, revealing the underside of the wooden roof from the ground floor. This gallery-like floor is covered in white plaster that puts the focus on the woodwork, which is accented by strip lights. "The ugly steel construction gave rise to the design, but even without it this design would have come to the surface as the most logical and best choice – a sleek shape with an atrium in which the historic roof construction is visible," said the studio. "Instead of throwing away the ugly, we have put it to good use. The remaining choices all stemmed from this one decision." Windows set into the roof allow natural light to shine down onto a dining table set in the atrium. 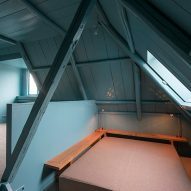 Three guest bedrooms and a self-contained studio with two further rooms are set around the opening upstairs. The large wooden beams encroach into the bedrooms and bathrooms, which are set beneath steeply sloping ceilings. The spaces are finished with neutral textiles and white walls that help to keep the spaces bright, but a vibrant yellow corridor marks the threshold to the owner's more colourful living quarters. "It looks just like an architectural phenomenon from the past. 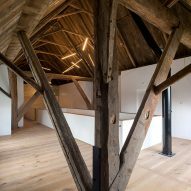 Yet the proportions of the guest rooms, the wall of yellow stones, material choices for facades and walls, the location and size of the kitchen and other rooms also all stemmed from the sleek ceiling with atrium and the desire to emphasise the historic qualities of the barn," said the studio. 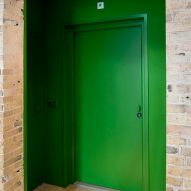 "As we matched the materials and colours of the stables in a sober and authentic way to fit with the nature of the building, so we chose striking colours for the original house," it added. "Just as they used to be, house and barn are now separate worlds that complement each other." 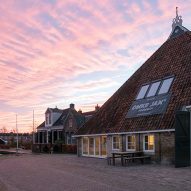 While Piet Hein Eek might be better known for his design work – including a collection of furniture made from timber offcuts and a watch with cog-like indentations – he has turned his hand to architecture before. His last project involved converting an old mill in France's Dordogne region into a series of holiday rentals – a project that took him 10 years to complete. Eek placed at number 20 among the designers that made it onto the inaugural Dezeen Hot List. Photography is by Thomas Mayer.